You can’t force someone to innovate, and you can’t tell someone to learn. Demanding creativity usually results in the opposite, and hoping that opposing parties will agree on a solution rarely ends well. But innovation does happen and—somehow—people learn. Great ideas come to people, and stakeholders align behind a common cause against all odds. The critical question is, how? The difficulty is that many of our expected outcomes—around innovation, creativity, and learning, for example—focus on properties we can’t directly influence. These things just emerge when they emerge: not on command. They have emergent properties. While you can’t say in advance what “an innovation” is or should be, you know it’s innovative (that is, the product of innovation) when you see it. We teach, but the objective is learning. It’s easy to plan what we will teach but difficult to say when learning will happen, or if it actually did. We need deliberate thinking and planning to achieve emergent results that are better than random. To innovate, we must skew the day in ways that will spur innovation. We call this Emergent Design (ED). The emergent part happens at a few levels. One way is by intentionally piecing together the flow of the day. Another is emergence in the course of the day—adapting when the plan doesn’t match the reality on the ground. Emergent Design is about being willing to throw away the plan and listen, be with, and feel what wants to come forth from the group. It is also about quickly re-imagining and creating a new plan. One of our colleagues says Emergent Design is the willingness to stop a bus in the middle of the road and take a group somewhere that will catalyze even more emergence. All of these definitions are right—they are all Emergent Design. 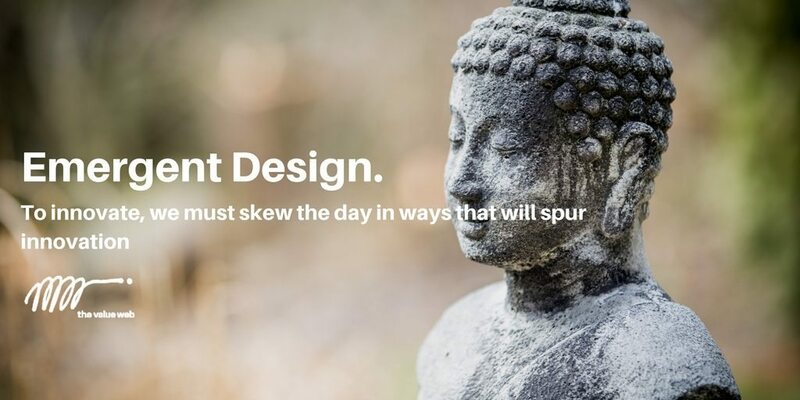 Emergent Design is a mindset, a philosophy, and a set of methods for drawing specific outcomes from a system, It is a method for focusing on what you can control to get the results you want and make the most of what you can’t control. The Value Web has always strived to be emergent in our approach. Now we are working on better describing what that means to us and how we do it. So, here’s a first draft of what we see as the common elements. We hope you will share your view and help us develop a better understanding of this practice. Objective setting requires a rigorous approach: Everyone involved must know and agree on what “good” looks like, or at least how to recognize it. This is the “North Star” for figuring out the flow of the day—a clear direction that helps keep everyone’s eye on the prize. What if you realize the prize you were aiming for was wrong? Then emergent design is essential in figuring out what the right outcome of the day is. Different types of emergence have patterns that allow it to happen time and again. Having a model for the patterns allows you to shape the day and skew towards the emergent outcome you are looking for. At this time in history, we know so much about how humans work (or don’t) that we can increase the odds for success. Psychology, sociology, architecture, systems dynamics, social physics, economics—we can draw simple rules from these vast bodies of knowledge to experiment with how we come together to solve problems and grasp opportunities. Fire won’t ignite without oxygen; basic rules help us shape the physics of emergence. These three elements, when properly mobilized and assembled, create conditions for emergence—a heightened state of awareness that allows you to tap into the group’s highest potential and spontaneously create outcomes that align with your strategic objectives. Over the next few months, members of The Value Web will continue to work together to describe our approach to and understanding of the practice of Emergent Design. We look to the broader community of practitioners and dreamers to offer their insight and examples. What practices and methods have you seen or used that can be described as Emergent Design? What makes them so?